Some homes are not close enough to a centralized sewer system, and instead use an onsite sewage disposal system, or septic system, to clean up water that comes from toilets, bathtubs, sinks, and washing machines. This technology can work well, but it needs regular maintenance to work properly. A typical conventional septic system consists of a septic tank, distribution box, and a soil absorption field, or drain field. Wastewater flows from the home to the septic tank, where solids settle to the bottom to create sludge while fats, oil and grease float to the top to create scum. The liquid, or effluent, between the two layers flows to the distribution box and into the soil absorption field. Bacteria and other microbes help break down the sludge in the tank and help remove nutrients and pathogens from the effluent in the soil absorption field. 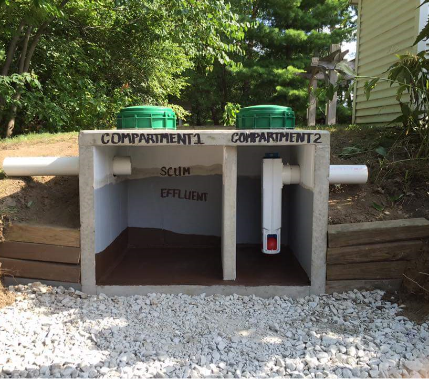 There are approximately 800,000 septic systems in Indiana, and the Indiana State Department of Health (ISDH) estimates that 200,000 of these are inadequate and have failed or are failing to protect human and environmental health. According to a publication by Purdue University on Septic System Failures, it’s estimated that a failing septic system can discharge more than 76,650 gallons of untreated wastewater into Indiana’s ground water and surface waters per year. Proper maintenance and care can help keep septic systems working properly and in turn protect human health and water quality. Regular maintenance can also save money, preventing the need for expensive repairs or replacement.